Do not go out at night: GRIZZLY SHARK lurks in these woods. There are many dangers of the deep, but none so deadly as SEA BEAR! Thrill to the adventures of these two exciting new characters. Told in two full-length stories written and illustrated by RYAN (INVINCIBLE) OTTLEY and JASON (THE ASTOUNDING WOLF-MAN) HOWARD. 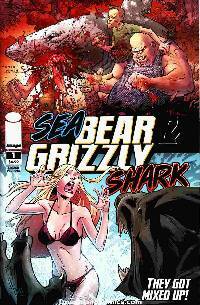 Also featuring a special prose origin story written by ROBERT KIRKMAN!